In the world of sales, presentations are everything—giving a good pitch is essential to winning over your customers and convincing them to purchase your product. 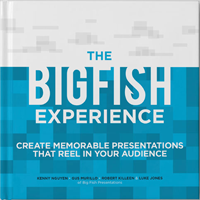 At Big Fish Presentations, I have the great opportunity to help clients close large deals and secure investments by improving their sales presentations. When it comes to helping our clients deliver better presentations, I have to prove to them we know what we’re talking about by giving our own unique sales presentation. We’ve had to create, refine, and continuously battle-test our strategies when it comes to selling our services. LEARN TO ADAPT TO AUDIENCE PERSONALITIES. Drivers. People who are very gung-ho and might miss part of process if not repeated. These individuals might risk missing important details by moving too quickly. Expressive. People who can express concerns easily. They are the best, as they are more upfront with all issues. Analytical. People who analyze every logical detail They take a longer time to close, as they need more information to be logically swayed. Amiable. People who are difficult to read and take the longest to close. Asking questions will help you discover more about what they’re really thinking. It’s not enough just to know what your audience wants. It’s important to go even further by catering your pitch to your audience’s personality. Answer your audience’s issues head on. There are always elephants in the room restricting trust—the most common one being money. Addressing known issues head-on before the audience brings it up will prove that you’re not afraid to talk about the hard stuff. Be honest about what you can and can’t do. If you can’t do it, explain how the audience can still walk away OK despite sacrificing yourself. It speaks volumes when you can refer them to someone that can. Be human. Don’t hide behind corporate speak and jargon when presenting. Tell relatable stories and experiences, and be funny. Self-deprecation is a common form of humor that can be relatable and lighten up the mood. Have positive body language. Make eye contact and keep an open posture. Control your pitch and pacing. Avoid being monotone. For example, if you’re talking about a company’s issues, deliver your points in a serious tone with plenty of pauses. You’ll come off more as more trustworthy if your tone matches your message. Overall, quit selling and help the customer buy. Be honest and sincere, and look out for the customers’ best interest. One of the first things I tell any salesperson is DO NOT give prices to new prospects without establishing value first. First time sales are based not on real value but perceived value. For example, think about the experience of buying an expensive computer. The salesperson at the store greets you and starts asking questions to discover what you are looking for. After finding the perfect computer for you, they tell you the price. Most likely, sticker shock ensues and you start to wonder if you really need the computer. If the salesperson can adequately state how the value of the computer trumps price, they’ll get the sale. While this isn’t a presentation in front of a large audience, it’s still a sales pitch. This VPV sales technique has helped us grow our sales exponentially while building trust with prospects. As long as we deliver what we say will be delivered, we know our clients will come back to us, and price will be less of an obstacle. Remember, sales presentations are tough. At the end of the day, while establishing trust is essential for a proper sales pitch, having the right attitude to get up even when you fall is essential for a salesperson. Understand that if you do fail, it’s OK. You’ll fight to see another day. Everyone gets rejected. When you fail, it’s not you that failed—it’s your process. So hone your pitch process continuously, but be prepared to reap the benefits.